This delicious shrimp stir fry is a recipe that you can throw together quickly and easily. You can also substitute vegetables you have on hand for the vegetables that are listed here. I often make it without rice or pasta but these two will add to the flavor. When I serve over pasta, I use Ziti or the tube style noodles. In a large frying pan, melt the butter and add the garlic, sauteing for approximately 2 minutes to bring out the aroma. Add in the vegetables and seasoning, and stir while cooking for another 2 minutes. Add the shrimp and stir fry for 5 minutes or until shrimp turns pink. Add the chicken broth and cook for an additional minute. Serve immediately--either plain or over pasta or rice. 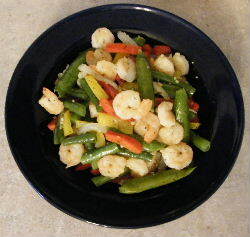 Click here for more great seafood recipes like Shrimp Stir Fry!